Summer is here and we all wish there would be more free time to enjoy it. Here's a secret: that's doable. Just use some proven methods to set goals, monitor what's happening and you get 80% of your work done in 20% of time. Just be smart about it. Hanno is a leading design team spread out over the world. Here's the proven method they use to manage their productivity and collaboration. SMART Goals Test: Are Your Goals Smart? There are four human capital strategies which combined can give you that growth. Practical advice on a compensation method that really works. Being a remote manager can work out great. Just follow these best practices. Reif Hoffman, LinkedIn founder, on "a dishonest conversation" with employees. Guidance from a millennial to his peers on diving direction to yourself. Screw Motivation. You Need Discipline. On the somewhat unpopular and entirely correct choice of cultivating discipline. 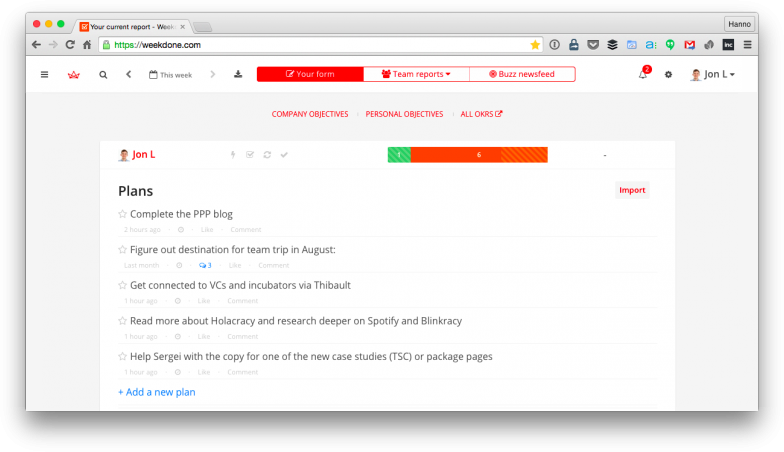 Why using tools like Weekdone is crucial for any team. Listen closely to your employees and make that your primary gauge of performance. Want More Employee Productivity? Figure Out Their "Flow"
The concept of "flow" for doing better work is something everyone should learn.